Multi-zone capable. 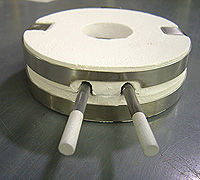 Each GRR unit is provided with non-toxic ceramic insulator shell. Uniquely made with patented nano-material content. Please contact MHI for dimensions of GRR units or use the table below. Use with DC or AC current (50/60 Hz). GRR High Uniformity Robust Radiators may be used to approximately 1300°C. For temperatures higher than 1300°C for the Robust Radiator, please click on Robust Radiators. Provide the ID and desired length of your heated zone to calculate the maximum power below for GRR™ Robust Radiator. ** Plug-in voltage indicates closest IBPAN preference. The GRR unit-temperature, the element maximum-temperature, the rated amperage (current) or power, cannot be exceeded in any configuration of use. 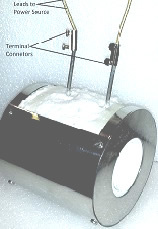 The configuration of use will change with end caps, load, flow, placement of control thermocouple and extent of insulation that is ordered. If not puchasing a MHI control system with the GRR unit/model or if choosing multiple units, please confirm the RR volts of the unit with the sales agent. Live Customer Support by phone (513-772-0404) or email. . Typical single and Multi-zone configurations are shown below. Terminal connectors are shown for each-zone. End-caps and all other accessories available - see section on Robust Radiators. Multi Zone Stacked GRR modules. 6 Stack Module.